We still see unemployment rising. The primary trend is the state and local government cannot print money and are the major source from which jobs will vanish. Of course there is the natural evolution of changes within the economy as it continues to evolve. That means there is some reduction in jobs due to the internet. That is natural with any technology shift in advancement – automobiles wiped out horse & buggies. While that will contribute to rising unemployment from the private sector, the public sector is the one really in the crash and burn mode where jobs destruction is taking place not just displacement. Parking garages are run by machines today in so many places. Tolls are collected by EasyPass yet they continue to rise. This is part of the public sector job creation. The big one comes at the end when there is a tax revolt. The elimination of cash is also contributing to job loss in both the public and private sectors enabling electronic payment at gas stations and tolls. But the public sector has no revenue but taxes. It is not the horse and buggy merely being displaced by new technology. This is job destruction because it just does not work. Even the Post Office just announced it is stopping Saturday delivery. Technology shifts are ALWAYS responsible for changes in labor make up but are of the nature that is more displacement rather than destruction. This is why UNIONS have been so bad. Their original purpose of working conditions has long been displaced with legislation. Now UNIONS are all about freezing technological advancement and education. Instead of someone advancing in skills to earn more, UNIONS seek intimidation to force advances in pay without advances in job skills. This has led to inflation driving costs up for the same work rather than advancing skills to attain the same result. As that same job becomes expensive, jobs vanish and move overseas to escape the unions. Nevertheless, technology advancements like trains put Wells Fargo stagecoaches out of business and created the mail order business allowing goods to be delivered giving birth to Sears, the automobile impacted the horse and buggy as well as trains locally but gave rise to the oil industry, the airplane impacted trains long distance and reduced ocean liners as a means of passenger transportation between continents, computers have displaced pen & pencil pushers and furthered the advancement in science, and the internet has shrunk the world expanding markets while reducing newspapers as a long-term medium. 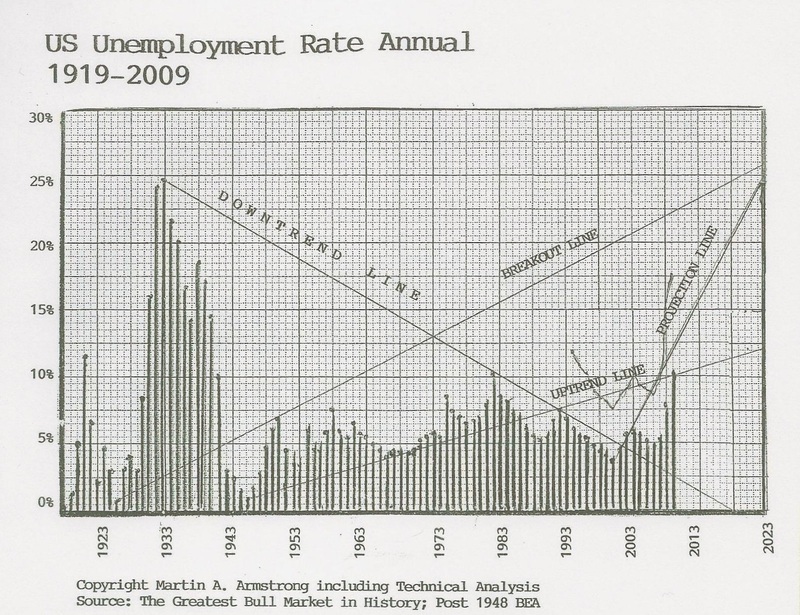 These trends are never the reason for dramatic rises in unemployment – merely displacement and evolution. Granted, individuals who cannot keep pace and personally advance in skills may become permanently unemployed. But this is a tiny fraction of the entire process. The rise from 8% to 25% unemployment during the Great Depression was the collapse in farming due to the Dust Bowl. Agricultural employment dropped from 41% to 3%. This was a wholesale job destruction. Yes it was also impart displacement. 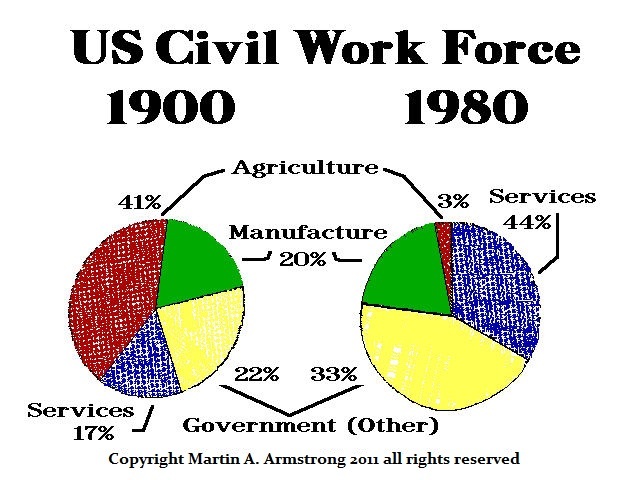 But this forced the American work force in mass from agriculture to skilled labor. Such massive transitions are rare, but send unemployment up rapidly and higher than a mere technological advancement in the same general industry. This is similar to the collapse in state and local government that is on the horizon. This is similar to the problems of transition Germany experienced merging the East with the West. The older generation could not cope. The youth adapted. Even during the Great Depression, local cities began issuing their own money because there was nothing around thanks to bank failures and hoarding of cash. They survived because they were lean back then. Today, they employ vast hoard of people who are far less productive than those in the private sector the same as Germany saw with its transition. The common view was it took 2 to 3 East German workers to do what one West German could produce. They did not know how to be productive. Under communism, there was no real skill advancement, just a job to be filled.